Tag line: "HAUNTED BY A DREADED CURSE!" I’m not a big fan of 1935’s Werewolf of London (the first Hollywood movie to feature a werewolf), but compared to 1946’s She-Wolf of London, that earlier film is a horror masterpiece! Phyllis Allenby (June Lockhart) is engaged to be married to brash young lawyer Barry Lanfield (Don Porter). In fact, their wedding is only a week away, but instead of picking out a dress, poor Phyllis is wrestling with the “Allenby Curse”, which, according to legend, has been turning members of the Allenby clan into werewolves for generations. Despite the reassurances of her Aunt Martha (Sara Haden) and cousin Carol (Jan Wiley), both of whom tell her that the curse is balderdash, Phyllis is sure she’s responsible for a string of murders that occurred in in a nearby park (in each case, the victim was mauled to death), and as a result has shut herself off from the rest of the world. Is Phyllis actually a werewolf, or is someone else the killer? The cast of She-Wolf of London isn’t the issue; the performances are fine (I enjoyed seeing June Lockhart in an early role, before she, Dr. Smith, and the Robot got themselves Lost in Space). No, what She-Wolf of London lacks is tension, frights, and suspense of any kind. The few murders that do occur happen off-screen (even a later kill, set on a foggy evening, fails to generate a single ounce of excitement), and we never once get a good look at the so-called werewolf. 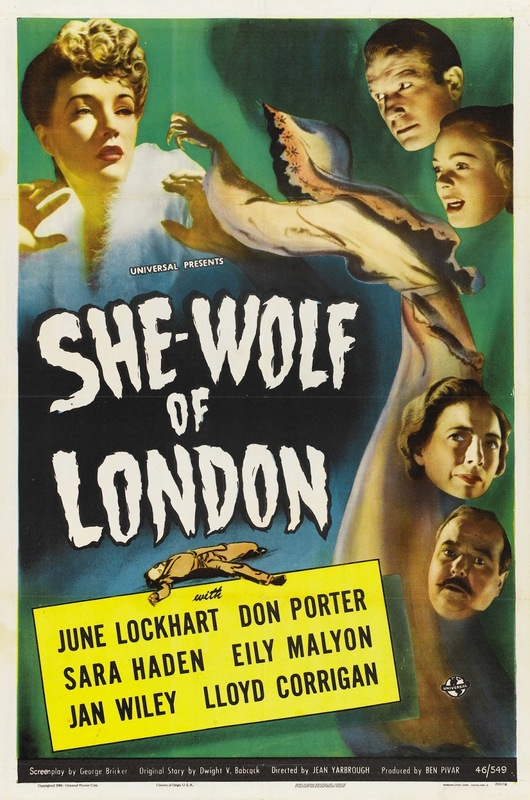 She-Wolf of London doesn’t even work as a mystery; I figured out what was really going on in the first 20 minutes of the film, and I’m fairly certain you’ll do the same. With no thrills or scares to speak of, She-Wolf of London fizzles right out of the gate, and never recovers. Though it runs for only 61 minutes, I guarantee it will feel like one of the longest hours you ever spent watching a movie.